There is a story about Marcel Duchamp setting a bicycle wheel on top of a wooden stool in his studio in 1912 and then leaving it, unnamed, to sit quietly in the corner. He “found solace in making the wheel turn while… gazing at it like ‘a fire burning in a fireplace’.”1 That wheel, like many before it, began a revolution, and the rest, as they say, is history. At a micro scale, revolutions can be predictable, dizzying and entertaining — like a bicycle wheel, or a child’s spinning top. At a macro scale, they can be tumultuous, life changing and difficult to perceive, like socioeconomic systems or planetary orbits. 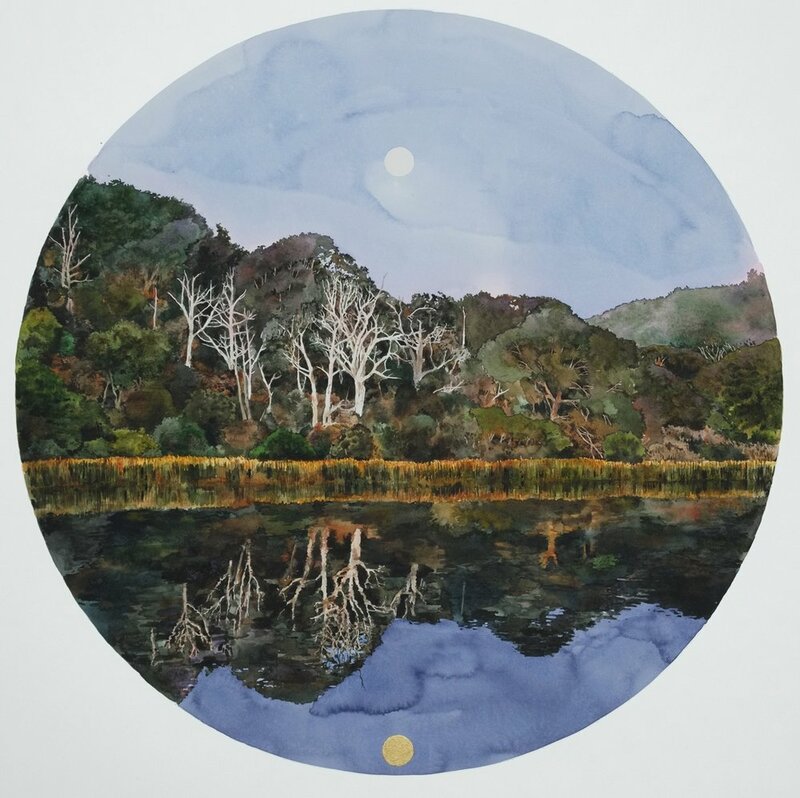 Near the entrance of Transit, in the foreground of Simon MacEwan’s I Sleep Beneath the Golden Hill (I), a golden circle sits on the water — a reflection of the moon, perhaps — in a painting of Arthurs Seat at dusk. The painting shows us the landscape as it might have existed in the colonial imagination, as an idealised wilderness. But it's not wild, of course: the painting is a constructed view of a constructed place. The name Arthurs Seat is a colonial imposition, bestowed by Acting Lieutenant John Murray when he sailed into Port Philip Bay in 1802 and saw a likeness to the rocky summit of Arthur’s Seat near Edinburgh. MacEwan’s picturesque view of the landscape evokes this colonial perspective by erasing all apparent evidence of human activity – there is no indication that the water is the human-made McLaren’s Dam, or that the trees are a mix of native and imported species. We simply see mountains, trees, water, sky, moon, reflections; and that small golden circle. Gold is not neutral; it is a signifier of many things: power, wealth, the gods, universal harmony, and salvation. Nor is gold is an Earthly element; is it formed when massive stars explode into a supernova, and most of the gold on Earth is deep within the molten core. The more accessible gold —the gold we can mine — came to us about 4 billion years ago from asteroids crashing into Earth. Gold does not rust, tarnish or corrode, and these enduring properties have made it the most highly valued and sought after of the heavy metals. It is also highly conductive and this, together with its non-corrosive properties, has made it a key component in the manufacture of electronics, such as computers and mobile phones. Gold has also been called ‘the metal of the Sun’, a reference not only to colour but also to the relationship between the power of kings or gods and the life-giving force of the Sun revolving around the Earth. Then there is Dutch gold, an alloy of copper and zinc that is used as imitation gold leaf at much lower cost. Unlike pure gold, Dutch gold tarnishes and will oxidise over time. In Transit MacEwan uses both, strategically choosing one or the other not for their economic value but to create symbolic and perceptual relations — and gaps — between them. In The Least I Can Do, the two sit side-by-side, physically and visually proximate. Over time, our ability to perceive the difference between them will slowly increase as the Dutch gold circle begins to tarnish and turn to brown and, eventually, black. In the centre of the gallery, the gold and black circle of MacEwan’s kinetic sculpture Messenger slowly turns, tracking time and marking a pace for our viewing. The disc completes one rotation every 58 minutes, equal to the duration of one minute on Mercury; and the slow, deliberate motion of each revolution is almost mocking — teasing of our agitated human movement. This mechanical device moves with a degree of control so measured that it defies our expectations of gravity and seems utterly other. It has the perpetual, rhythmic relentlessness that makes machine motion so alien — at once magnetic, repellent and otherworldly. It demonstrates that we exist at a different pace; and it makes us wait. Humans have been creating devices to track the movement of the Sun around the Earth at least since the ancient Egyptian and Babylonian sundials, which were further developed by Muslim astronomers to introduce the notion of equal hours. Astronomical clocks were used to show the position of the Sun, Moon and other celestial bodies in the sky as early as the 11th century. And in 1543 Copernicus’ heliocentric revolution brought us a new model of the armillary sphere – and of the Universe. These are all instruments that track Earthly time, as do the watches on our wrists and the phones in our pockets. With Messenger, MacEwan brings another time — the time of another place — into the gallery. It’s the same time, of course: time is time, lived time. And this shift in time is also a device. It unites the routinised clock-time of modernity with the revolutions of the planets, where time is observably relative in a way that is impossible for us to experience. And this device, too, makes us wait. The modern routinisation of time, which in turn structures activity, would, Walter Benjamin argued, result in a kind of perceptual redundancy whereby we become dulled through repetition, lulled by machinic rhythm into a kind of audio, visual, and lived monotony. But this perceptual redundancy, as expressed through technological repetition, might also “contain the possibility of unforeseen illuminations and understandings, that…could generate at least a momentary superseding of the standardisation of the senses. "2 Such moments are worth the wait. Early experiments with perception and motion, such as the Phenakistoscope, an early proto-cinema device that displayed a sequence of images on a rotating disc to create the illusion of movement, or Eadweard Muybridge’s photographic motion studies breaking down the movement of a running horse, demonstrated a gap between external reality and our subjective experience of that reality. MacEwan’s Everything is already always happening recalls these experiments, as well as both flipbooks and comic books, and draws attention to how we look — and how we see. Such image sequencing is a performance of repetition and difference. In MacEwan’s painting, as in a comic book layout, we grasp, the whole in a single glance, a god-like perspective; looking more closely we see the progression of individual moments that occur through time to produce change from the beginning to the end. The subtle differences in each of the images also makes it evident that these are not mechanical reproductions but are a series of paintings produced one after the other, as separate events in time. They demonstrate how action, through repetition, produces difference, thereby tracking shifts in events across time that might be visible only through a shift in scale. When, finally, on MacEwan’s large clock, the light hits the gold it produces a moment of illumination, and time seems to speed up as we watch the progress of an artificial eclipse. It is brilliant, bathing us in a golden glow, and then it passes. It is another moment within continuous motion, reminding us that we cannot expect to be forever in the light, for that is not how nature works. But we are trying. We light our cities and our lives with the energy that the golden Sun has been generating for billions of years, that has been stored as coal in the earth for hundreds of millions of years, and that burns up in seconds. As we watch, the golden disc falls back into shadow, and again we wait. Slowed to this planetary pace, we know that if this sculpture represents a very big thing (a planet) then we, by comparison, are tiny things; to the giant that is Mercury we are at best irritating, at worst insignificant. Scale matters; and so do speed and distance for how we experience and perceive objects and events. Einstein taught us this, and this knowledge helped us launch two golden records towards interstellar space: time capsules of life on Earth. But we are not very good at moving nimbly between the large and the small. Science, with its logical system for explaining time and space on both very large and very small scales, has enabled us to achieve many great things. But between the theory of gravity and the theory of atoms, there remains an unresolved gap. The works in Transit straddle a space between form and action, a space that Carolyn Christov-Bakargiev has called ‘a space of revolution’.3 They question how far our horizons extend, and how attuned our perception can be to the subtle differences that produce change over time. Looking back to the beginning, at I Sleep Beneath the Golden Hill (II), we see that the golden circle is still there, still sitting on the water with the reflections of the trees and the sky. But, critically, everything else has shifted. 2 Crary, Jonathan, “Spinning Histories: Displacement and reversal in the arts of perception” in Christov-Bakargiev, Carolyn, Revolutions - Forms that Turn, Thames & Hudson Australia, 2008, p.42.